This species is accepted, and its native range is Central & E. Turkey to Iran. Thymus balansae Boiss. & Kotschy ex Celak. 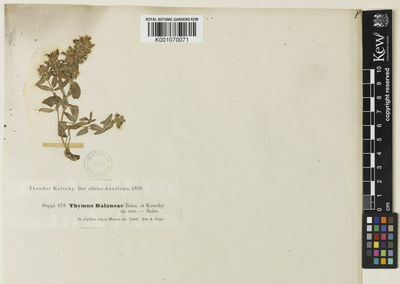 Thymus balansae var. pseudomarschallianus Velen. Thymus fallax var. balansae (Boiss. & Kotschy ex Celak.) Rech.f. Thymus fallax var. pseudomarschallianus (Velen.) Rech.f.